There is always that guy who arrives at the local outfitter’s store every single year. You know who it is, once the rugged truck pulls up to the curbside, and watching as the onlookers passing by takes a peek in the back of the truck bed. As you suspect, as it happens every fall, he pulls out his big trophy to show off to the one’s who know him best. Of course, it is going to run through your mind on how in the world does he get so lucky? Pondering what his trick is, and how he does this every year, you hesitate to put your pride aside to ask him. Like many, it is frequently assumed that this hunter knows something that many of us do not. Or, perhaps he is just born with some talent, or has a deep parallel connection with the land. However, to your surprise, there is no secret trick or secret “séance” to his success every season. He just takes it upon himself to work harder than you do, every season. It is very rare that there is some secret to such success, or some trick that hides up his sleeve until the magic season comes around, or even some natural talent that he may poses. Alternatively, is just about the commitment to hard work. Having that commitment that most do not retain, it allows him to be the successful hunter that many other hunters envy. When you commit yourself in hard work throughout the year, you will also gain the success in scoring the beasts again and again, every season. It all begins immediately, following the last season. Post season scouting. So, if you want to be the one to pull out that big buck on your wall and brag about your success this season, dedicate yourself to working harder than most. Simply, by post season scouting. This is how you execute it. Scouting is going to be the most important and critical work that you will have to do year-round, as you begin to fulfill your expedition for whitetail season, and ensuring your success. It is going to be very critical that you analyze the details that you uncover as you are scouting, similar to architects creating blueprints for a new house. Without an architect analyzing the layout for the project, it is going to be an issue for when the builder starts on the project. The equipment and the materials that were planning on being used, is going to be altered to a significant degree. Resulting in the delay of the completion in building the new home. 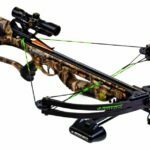 With hunting without the particular information that you would have found from scouting, is going to be very similar in this matter. You can go and set out and hunt blind, but without having the right equipment, you can be sure your chances of getting a shot, is very slim to none. There are many contrasting variables that fit together perfectly, so when you are hunting whitetails, you need to utilize the information that you find from scouting, and having undeviating success. The best time to gain this information, is postseason. From late winter to early spring, is an ideal time for postseason. This particular timespan is best for scouting for many different reasons. Number one reason is, that at this time you can scout without having to worry about the pressure you may put on the deer. Your presence can negatively impact deer’s behavior by every time you are heading into hunting property. 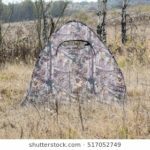 By making sure that you are keeping your concentration on scouting long before hunting season begins, in March, when it comes to October, your presence will not impact your hunts negatively. In addition to that benefit, by scouting early, you will be able to see signs from the last season. How? Once the snow starts to melt away in early spring, this will allow you to clearly see the trails that were made from last fall, as well as the preservation of last season’s track signs. Another benefit, is that you will also be able to tell which rubs are fresh from last fall. You can even identify the unique trails, tracks and beds in the snow conditions, even before the snow starts to melt. 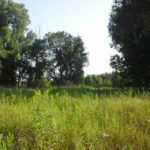 This will assist your perspective of the property you choose to hunt. Finally, scouting during postseason is going to benefit your endeavors because it is early to acquire “green-up”. Once the leaves and the undergrowth begin to grow in late spring, much of the signs from last fall will get covered, and will be much harder to identify. As mentioned before, there are many benefits in scouting with the snow, and then scouting again after the snow melts. For this reason, it is ideal you scout during both of these times. If it is at all possible for you, you should look to head out to do this immediately following the end of the season, while there is still snow on the ground. You can use this time to your benefit by better understanding the patterns of the late season. You should be following the trails, as well as identifying the beds in the snow. Now that you have established why it is vital to scouting postseason, it is time to analyze what it is you should actually be doing when you are scouting. When you begin to scout in the postseason, you are going to want to look for any information that can assist you in better understanding how deer actually use your equipment. This is going to help you to understand how to hunt them better than you have before. With that being said, there are going to be a sum of signs that you will need to keep your eyes on. Food is going to be one of the obvious signs you are going to use to your advantage. Food is the most important necessities in a whitail’s life. Food controls where and how much the whitetails are going to travel to and spend their time. With that, for you to gain the understanding in the different sources in food the property you are hunting on has, is going to be one of the vital pieces you will need to analyze. You most likely already know about the abundance of crop fields and such on the property, but are you aware of the food sources that are much smaller, let alone hidden to your naked eye? Isolated sources of food can be a very popular go-to place for whitetails, like apple trees, white oak trees, clear cut, or persimmons. Notably, if these sources are hidden, which makes it huge benefit in making the space your hideout. Obviously, deer need water too. Be sure you are looking out for isolated sources of water. 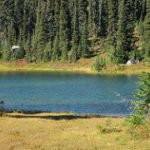 During the rut, or on hot days, you will need to take note of springs, water holes, ponds, and streams. These will be great locations to hunt, as well as keeping these locations in your back pocket. 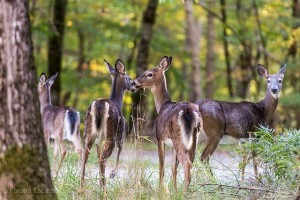 The doe’s bedding areas are the completion of the circle of the whitetail’s activities. Deer tend to spend more time near, or in their bedding places more than anywhere else. This is the main reason why it should be your main goal in finding, when you are doing your scouting trip, it is critical to know where these bedding areas are. When you are looking for the females during the breeding season, as you figure, there will be frequent visits to these spots by the bucks. So taking note of where the bedding areas will be an ideal tactic to utilize. You will know when you have uncovered a bedding area. You will uncover clusters, or small circles that are joined by at least three or more groups of such. Just as important as doe bedding areas are the areas that bucks use to bed, which are most often separate from their female counterparts. Buck bedding areas are typically separate from the doe’s bedding areas. Finding this area is going to be just as critical as finding a doe’s area. The buck’s beds are very distant from other deer, usually in a heavy covered area, or where they are able to see more of the surrounding areas. These areas allows them to have a better idea of the situation they are in, as well as protect them from the winds. While you are seeking out the buck’s beds, you will want to make sure you note how they enter, as well as exit these areas. Finding these funnels are going to give you great insite to deer movements. These are popular places that bucks often take advantage of. Funnels are the routes that deer take when they come across certain terrain that restricts their movements. These are very popular places to seek when you are looking for bucks. Typically, funnels are gaps in a fence on the property, creek crossings, strips of cover that are between the fields, or some other barriers, like rivers. Speaking of funnels, another great sign that you will want to keep your eyes peeled for, are the rubs, as well as rub lines. Finding clusters of these rubs is a good indicator that there are staging areas nearby, or even buck beds. They are also good indicator in finding travel routes that bucks take. These are often used by multiple bucks throughout the year. Make sure you note which side the rubs are on the trees. By this, you will be able to get an idea on which direction they normally take. So, make sure you do not overlook these clues. The final piece of rut related sign you’ll want to uncover are scrapes. These pawed up patches of ground can be great areas to hunt, especially if you find clusters of them tucked back into cover. Pay close attention to large scrapes found at the intersections of heavy travel corridors. These scrape hubs are often used repeatedly and can be great spots to check annually. Scrapes can also be great spots to place trail cameras. It’s been found that deer visit scrapes throughout the year and check the licking branches above them. With postseason scouting, this type of scouting involves a lot of traveling. You are going to be traveling across different properties that you are going to be hunting during the season. By taking notes of all the signs and the locations, will help you tremendously in creating your hunting strategy. If you are not logging these observations properly, many of the details that you have uncovered during this time may be forgotten. It also would not hurt if you can get an aerial map of the properties you are scouting, and label the types of different signs during your scouting adventure. Some people like to print them out before they go scouting, and mark them while they are in the woods, or wherever your preference is. Well, this is what I like to do, anyway. After my day is done, I go home, and I will edit the online map that has all the information that I uncovered throughout the day. I also take photos during my scouting as well. I find this to be useful to use in the future to improve my hunting strategy, and they are always in my records.